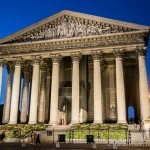 Dôme des Invalides: Photo of the Week | Travel? Yes Please! An unmissable monument in Paris’ cityscape is the glittering gold dome of the royal chapel at Les Invalides. Dôme des Invalides was first inspired by the dome at St. Peter’s Basilica in Rome. 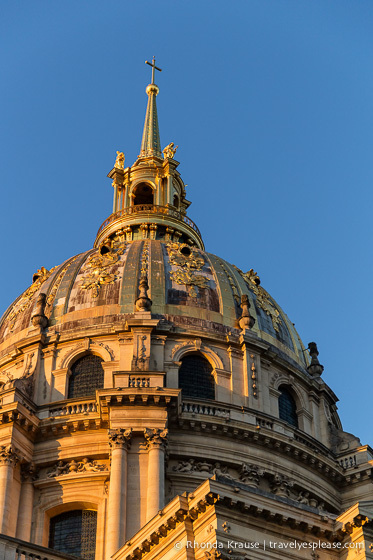 Designed by Jules Hardouin Mansart, the dome is considered one of the finest examples of French Baroque architecture. The dome was finished in 1708 and at 107 metres high, it’s one of the tallest monuments in Paris. Beneath the Dôme des Invalides is the tomb of France’s most famous military leader, Napoleon Bonaparte. For this photo, I caught a nice sunset shining on the dome, making it look even more gold than it already is! 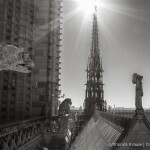 You can see a black and white version of this photo in my series “Paris in Black and White“. Frank - Beautiful photo Rhonda. 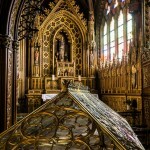 I didn’t know Napoleon’s tomb is buried here. We just came back from Croatia and we were surprised to hear that he made it to those parts as well. Fascinating history, that’s why we love Europe.